Flexible bipolar forceps might offer advantages over flexible clips delivered during NOTES, SILS or conventional laparoscopic cholecystectomy. Bipolar forceps allow multiple applications of energy and might be cheaper and quicker than clips. A new bipolar coagulation device, the BELA, 3.7 mm diameter, with insulated jaws limiting thermal spread, has been shown to be effective at sealing arteries up to 6 mm. 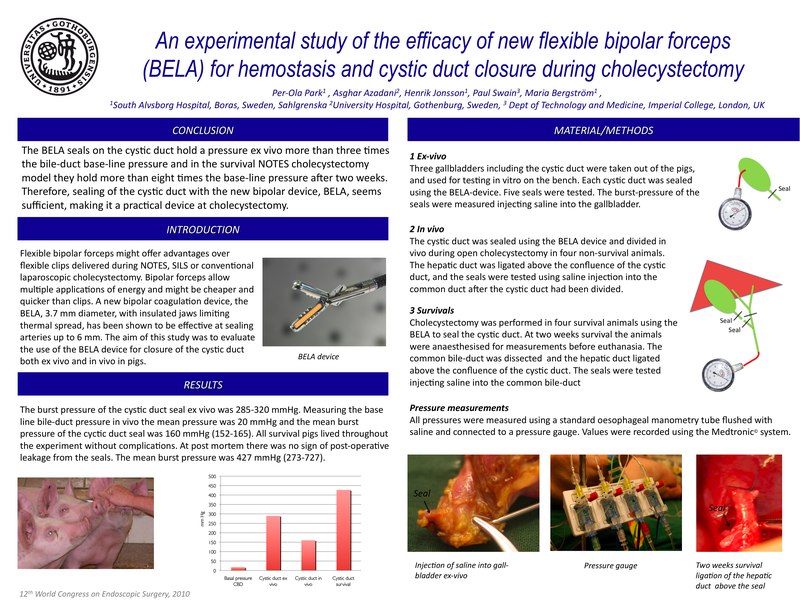 The aim of this study was to evaluate the use of the BELA device for closure of the cystic duct both ex vivo and in vivo in pigs. Initially three gallbladders including the cystic duct were used for testing in vitro on the bench. Each cystic duct was sealed using the BELA-device. Five seals were tested. The burst-pressure of the seals were measured injecting saline into the gallbladder through a two-channel nasogastric tube connected to a pressure transducer. Secondly, the cystic duct was sealed and divided in vivo during cholecystectomy in four non-survival animals. The hepatic duct was ligated above the confluence of the cystic duct. A two-channel nasogastric tube was inserted through the papilla into the common bile duct. The seal was tested using saline injection through the tube into the common bile duct. Finally, cholecystectomy was performed in four survival animals using the BELA to seal the cystic duct. At post mortem two weeks later the common bile duct was dissected and the hepatic duct was ligated above the confluence of the cystic duct ad a two-channel tube was inserted through the papilla. The seals were tested injecting saline into the common bile duct. The burst pressure of the cystic duct seal ex vivo was 285-320 mmHg. Measuring the base line bile-duct pressure in vivo the pressure was 20 mmHg and the mean burst pressure of the cyctic duct seal was 160 mmHg (152-165). All survival pigs lived throughout the experiment without complications. At post mortem there was no sign of post-operative leakage from the seals. The mean burst pressure was 427 mmHg (273-727). The BELA has been shown to seal arteries of the size of the cystic artery. In the current study the BELA seals on the cystic duct hold a pressure ex vivo more than three times the bile-duct base-line pressure and in the survival NOTES cholecystectomy model they hold more than eight times the base-line pressure after two weeks. Therefore, sealing of the cystic duct with the new bipolar device, BELA, seems sufficient, making it a practical device at cholecystectomy.